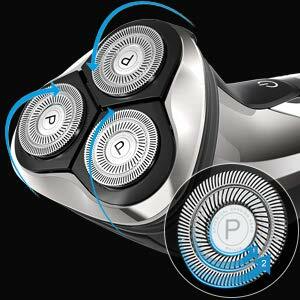 The Phisco electric shaver is a machine that delivers premium quality without high-costs. 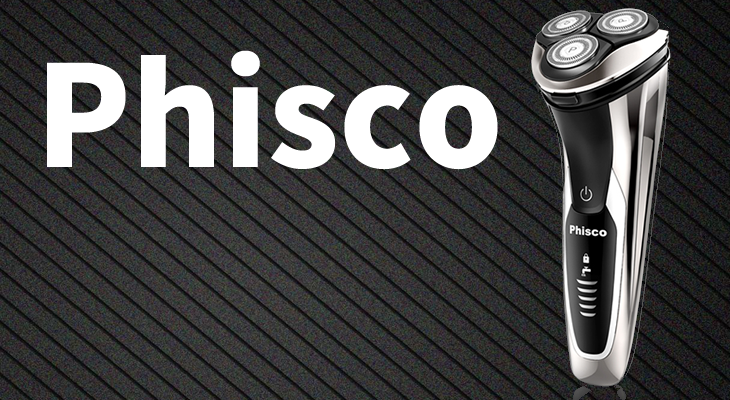 While the Phisco brand is not amongst the most well-known shaver brands, such as Braun or Phillips, it is still able to provide an excellent shaving experience. The Phisco IPX7 has many qualities which makes it stand out from the shavers in its price range. It has clean black and platinum design which gives it a high-end appearance, especially together with the rotary style flex heads. 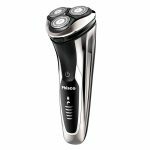 The Phisco electric shaver is a 3D rotary style shaver equipped with 4 directional Flex Heads which can easily follow the curve of your face and neck giving you a comfortable, clean and easy shave. This kind of rotary style shaver is mostly recommended for those who prefer to shave daily. The Phisco machine is gentle to your skin and thanks to its 4 directional Flex Heads it is able to access hard-to-reach places. 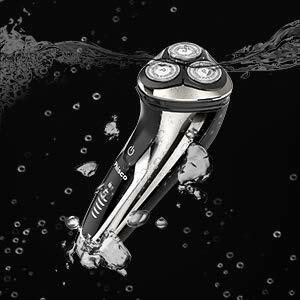 The Phisco IPX7 is also equipped with self-sharpening dual-track blades which further enhances the comfort, pace and precision of your shaving experience. After precision and comfort, the most important things in a shaver are charging, quietness and extra features. One hour of charging can last for 120 minutes of cordless shaving which is not bad in this price category. This electric shaver is also extremely quiet which can be a real relief at your morning shaving w hen all you want is quiet and a fast shave before work. The extra features include an intelligent LED display and an advanced IPX7 Waterproof System. The intelligent LED display has a cleaning reminder which reminds you to run the head under the tap after each shaving. It also shows the battery percentage and reminds you when it’s time to charge. This way you’ll never be surprised with a dead battery. 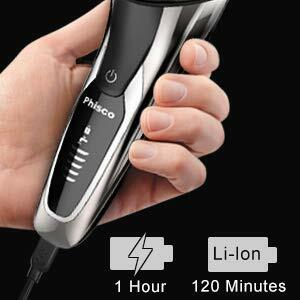 The Phisco electric shaver also has a travel lock feature which is shown on the LED display. Next up, one of my favourite features, the advanced waterproof system. 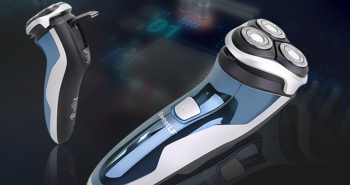 Most new shavers on the market are equipped with a waterproof technology which means that you can shave wet or dry, using shaving foam or gel and shave in the shower. This can save you significant time in your morning routine. It can also mean a big help when it comes to the cleaning and maintenance of your shaver. With Phisco’s whole body being washable you can easily clean your machine with just running it under the tap. However, a cleaning brush is also included if you need to get rid of any residue hair in your shaver. 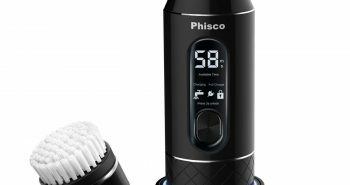 An additional significant feature that Phisco has is the pop-up trimmer which allows you to trim longer facial hair such as your moustache or sideburns. In my opinion, this feature should be included with all rotary-style shavers, so that you don’t have to sacrifice the trimming for a clean shave. Sometimes you need both. The box includes the shaver and a protective case for the rotary head as well as a little pouch for the USB charger and the cleaning brush. It also includes a manual which guides you through the usage, charging and cleaning of your new Phisco machine. All in all, I would highly recommend the Phisco IPX7 shaver as it is an excellent machine in its price category. It is fast, precise, comfortable and equipped with many extra features such as the intelligent LED display and the waterproof system.